There's actually a number of new cars at the Detroit show that I like — I think Chevy did a fine job with the new 'Vette that we've been carefully ignoring, and that Audi RS7 is really impressive. But the only one I sat in and genuinely felt like I was in something really new and different was the Tesla Model X.
Tesla certainly has their share of issues, not the least of which is the still mostly unanswered question of can they really make these cars in quantity. Also, the Model X I saw here isn't truly a production model. It's not really a concept or a show car, either. Tesla's people told me it's a "design prototype" which they said means that it represents what the final production design will actually be. Interior materials and a number of details may change, but I was assured that the fundamental body design and features will remain. Based on their (currently, still few) production Model S cars, I feel reasonably confident that the materials and fit and finish will be close to what I saw at the show, though likely not in white. So, let's give them the benefit of the doubt that they'll build something close to what this looks and feels like, and I'll tell you why you should care. First and most obviously, the car has gullwing doors. And I think this is one of the very, very few examples of gullwing-type doors being used on a car other than a high-performance car, and for a utilitarian purpose. Well, if you don't count helping you get laid as utilitarian. Technically, Tesla calls these doors "falcon wing" and they differ from traditional gullwings in that they're hinged in the middle as well, which allows them to open without demanding almost any space at all on the side of the car. Tesla's PR people insisted to me that these doors can open in a smaller area than a minivan's sliding door. That's both impressive and actually useful. Plus, the size of the opening of the door is remarkable. When open, the hole in the side of your car is like that of a door and a T-top combined; I've got plenty of baby-shoving-in-cars experience, and this would make loading even a toddler-sized coked-up octopus easy. There's so much open access into the Model X, and that's with the middle row of seats up, even. Which brings up another point: many may see the Model X as a sort of SUV, but it's closer to a short van with a hood. It seats seven in three rows and the middle row can fold onto the floor to create a sort of ottoman/low tableish surface. With that down (it was locked on the car we saw here, but I was shown how it would work) you'd have a really flexible and useful interior space to be in. It would solve many of my latent little-van desires in how it could act as a mobile little room, as well as being flexible enough to seat seven people and their luggage. I'm sort of a space-utilization fetishist when it comes to cars, and I can get as excited about a car that uses space really well as I can about a car that goes really fast. The Model X feels like a modern version of one of my all-time space-utilization heroes, car-wise: the rear-engine wagon. Cars like the Volkswagen Type III and IV, the Corvair wagon, the Fiat 500 Giardiniera, and a few select others. These cars all had good (for their size) cargo room in the traditional wagon area in the back, and a trunk up front. The Model X fits in perfectly, with good cargo room at the rear, and a deep trunk (sorry, Tesla, I'm not calling it a goddamn "frunk." Not even if you give me a frookie) in front. This layout is possible here thanks to the use of the Model S platform, which is like a big skateboard of batteries and motor. In the Model X's case, they've added an electric motor to the front axle to supplement the rear-axle mounted 362 or 410 HP motor, giving more power and AWD. 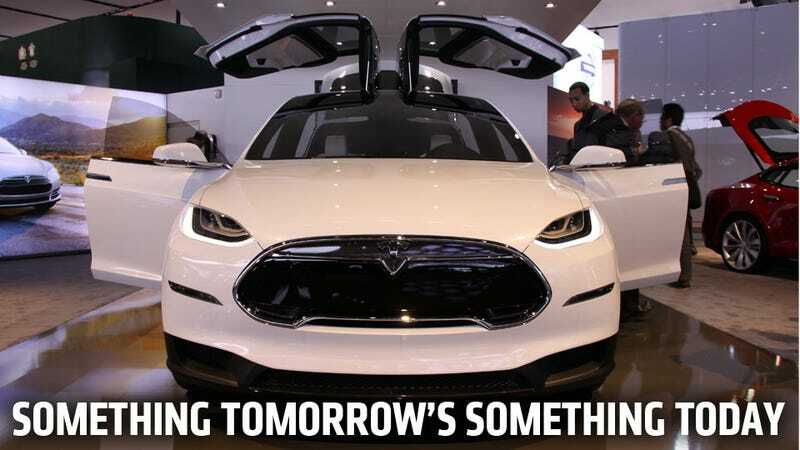 Tesla says the Model X will get to 60 in five seconds with this setup, which sounds great. Though to be honest, I'm so taken by the Model X body layout I'd be interested in this car with, say a flat-four Subaru engine mounted under the back seat, in front of the rear axle, replacing the batteries with a gas tank and the necessary other hardware. That would be outside of Tesla's fundamental goals, but it would still be a remarkable MPV-type car to the wider public. Of course, Tesla said in their press conference that their main goal — even above actually making cars — is to "accelerate the adoption of electric vehicles." So they're not going to go that route. But, if Subaru or all those other (one) companies that make cars with flat engines (maybe one that begins with "P"?) want to steal this design, I'd be all over that. Two normal doors, two gullwing doors, two trunks, van-like interior space, awd, sleek exterior design, world-of-tomorrow dashboard and electronics, and a (claimed) range of up to 265 miles — what's not to like here? They stated they'd like to make it available for about $30,000 as well. I'm still on the fence about all-touchscreen controls, but it's hard to deny it doesn't look cool and appears to be very well-thought out. I guess the rub here is the uncertainty if it'll ever happen. It certainly could, and the Model S success or failure will be a big indicator how likely it actually is. I hope so. Perhaps some of my ardor is the result of being a man with offspring, and the associated practicalities that entails. Maybe that's why what is essentially a minivan is so interesting to me. It could be my geeky love of maximized space, it could be all the fumes from prototype plastics getting me high. I don't know.